Sylvester Uzoma Onyejiaka II — the Austin, Texas-born arranger, multi-instrumentalist and producer who goes by the moniker Sly5thAve — returns with an orchestral tribute to the prolific DJ, producer, rapper, and mogul Dr. Dre. Culled from a live set compiled for a charity event titled “Cali-Love,” Sly5thAve’s arrangements, which were praised by Dr. Dre himself at the concert, pay tribute to Dre’s brilliance in the producer’s chair while presenting new and interesting ideas in a set of well-worn but still funky grooves. 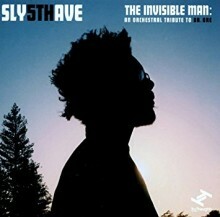 On The Invisible Man, Sly5thAve uses Dre’s compositions as vehicles for his own interpretations and improvisations, treating gangsta rap as jazz arrangers of yesteryear treated Tin Pan Alley songs. Sly5thAve’s jazz-inflected approach to musical borrowing is heightened by Dr. Dre’s own extensive sampling of 70s P-Funk in his original music, creating layers of intertextuality for hip hop heads and jazz cats alike while retaining (at moments heightening) the cinematic qualities of the source material. Dre’s compositions have always told vivid and imaginative stories. The Invisible Man tells similar stories, with instrumental arrangements in place of most of these songs’ most memorable lyrics, to the effect of making the album feel like the really good remake of a slightly better original movie. Overall, Sly5thAve stays very close to both the spirit and letter of his source material, often giving his crack band opportunities to improvise over his dramatic orchestral readings of this catalog in the same way that Dre gave Snoop Doggy Dogg room to stretch out over the original versions of these songs on The Chronic. Sure, The Invisible Man is no replacement for the original cuts, but it’s a great way to get away with playing G-Funk at a dinner party. Publisher: Faber & Faber, Inc. While hip hop music is known for many things, some good and some bad, often overlooked is its politics. Like other forms of Black music, hip hop has always reflected socio-political issues and the ideas of Black Americans. In Somebody Scream! : Rap Music’s Rise to Prominence in the Aftershock of Black Power, Marcus Reeves explores hip hop’s political nature over the course of 300 pages. A native of New Jersey, Reeves is a journalist who has followed hip hop since its early days and has professionally covered the music for over fifteen years. His work has appeared in The New York Times, The Washington Post, Rolling Stone, and Vibe, among others. He was also deputy music editor at The Source and a columnist for Russell Simmons’ One World magazine. 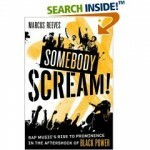 Reeves features a number of major hip hop artists in his effort to demonstrate how rap music was “a unifying expression for the post-Black Power generation and, eventually, the world” (xi). Artists such as Run-DMC, N.W.A., Tupac, and Eminem are the means by which Reeves discusses hip hop’s political nature. Particularly compelling is the chapter on Dr. Dre, Snoop Dogg, and Death Row Records titled “Gangsta Chic.” In it, Reeves discusses how Death Row crafted the atmosphere and attitudes of the post-1992 L.A. Riots era into commercial music that revolutionized the hip hop market. Reeves does an excellent job of presenting how Death Row records was situated within the context of a volatile, urban Los Angeles. While context is definitely one of the strong points of the book, it is also of the problems. In many of the chapters, Reeves provides unnecessary historical information regarding the artists he features. For example, the founding of N.W.A. has already been rehashed numerous times, so the inclusion of these details seems redundant and somewhat unimportant to the overall scope of the book. This is a minor distraction, however, and takes little away from the book. Reeves is very successful in presenting hip hop as an artistic manifestation of the political ideals of the post-Black Power generation. Overall, Somebody Scream! is very informative and engaging, and provides a different lens through which one can view this often maligned and misunderstood culture. This book is recommended to both scholars and fans of hip hop music and culture.